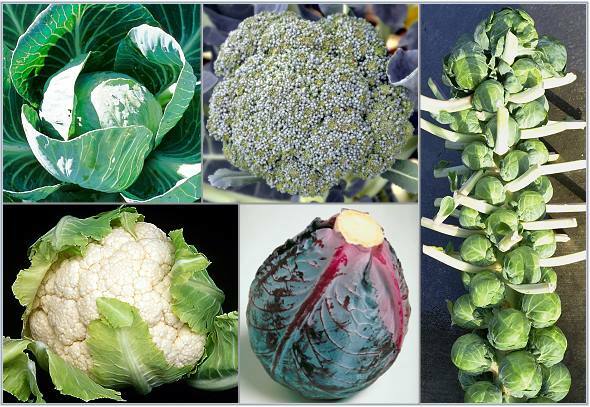 Brassica is the genus that contains Brussels sprouts, cabbage, broccoli, cauliflower, collards, kale, kohlrabi, mustard, turnips and other crops sometimes referred to as cole crops. Cole is from the Latin word for cabbage. Cole crops are cool weather crops and generally grow best when day time temperatures are 80 degrees or less and night time temperatures are 60 degrees or less but not freezing. For warm summer areas this means a late summer or early fall planting. For cooler areas this means planting right after frost in the spring. Brassicas like most veggies like fertile, well drained loamy soil with a pH of 6.5 to 7. Prepare beds several months ahead by adding compost. During the growing season use vegetable fertilizer which should be lower in nitrogen and higher in phosphorous. Brassica seedlings should be planted so the roots are buried but not the stem. Firm the ground gently to make good contact with the surrounding soil. Water gently but well. Brassicas are water lovers and should not be allowed to dry out but the ground should not be soggy. Full sun is a must as is protection from harsh winds. Brassicas should be rotated to other beds at least every 3 years. Planting in a bed that has had a nitrogen fixing crop like peas or beans is advisable. Insects can sometimes be a problem. Covering with a light row cover can help protect delicate seedlings. Usually once the plants take on some growth insects are not as much of a problem. However, the fabric can be left on the plants throughout the growing season, if necessary. If snails and slugs are a problem, Sluggo can be applied at the time of planting. Our Brassica collection includes Long Island Brussels Sprouts, Emerald Cross F1 Cabbage, Arcadia Broccoli, and Snowball Y Cauliflower. LONG ISLAND BRUSSLE SPROUTS (Brassica oleracea) : An heirloom dating back to the 1890's, Long Island is still grown commercially. As you can see from the picture on the far right, Brussels Sprouts grow a tall stem and then sprout little cabbages all along the way. One stalk can have 40 to 50 sprouts. The leaves of Brussels sprouts get quite large so the plant does require about 18 to 24 inches per plant. Since, Brussels sprouts take a long time to grow quick crops like lettuce can be grown in the empty spaces between plants. In cooler areas, transplant as soon as possible in spring for a late summer harvest. Warmer summer areas can plant early also but may not get a mature crop if temperatures get above 80. If this happens, Brussels sprouts leaves can be harvested and are quite tasty. Fall crop seedlings should be put into the garden about 90 days before your first frost. Brussels sprouts that are almost mature can take light frost and improve with flavor as the weather gets colder. Bottom leaves that yellow or show signs of mildew should be removed and disposed of away from the plants. Sprouts form at the base of the leaf, starting at the bottom of the stalk, and can be harvested as soon as they get between one and two inches in diameter. Twist off gently so as not to damage the stalk and use as soon as possible. They can be refrigerated for a couple of days in a sealed plastic bag. Wash right before using. While the traditional method of cooking is to boil the sprouts, this is also our least favorite. It is really easy to over cook them this way producing a foul smelling, grayish orb we wouldn't feed our cat or our family. By steaming, we can get the sprout to the stage where the fork goes in but doesn't shatter the sprout. At this point we like to cut them in half and fry in a little olive oil and butter. Frying until golden brown allows the sweet, nutty flavor of the sprout to come out. Toasted almonds and lemon juice added at the end are a nice touch too. EMERALD GREEN F1 CABBAGE: An All American Award Winner, this cabbage is an early season or summer cabbage that produces very solid, uniform green heads. In most zones, cabbage should be planted out as soon as frost danger has passed. Cabbages really like cool growing conditions somewhere around 65 to 75 degrees. For some warmer areas the only option may be to plant in the fall. If the main head is harvested by mid summer a second smaller crop of heads may be possible by cutting a 1/2 inch cross in the top of the stump. ARCADIA F1 BROCCOLI: Arcadia is often grown by commercial farmers. It grows in most of the US. It's large head has what growers call small to medium bead size. Beads are actually the flower buds. This variety is resistant to head rot, brown bead, and downy mildew. Broccoli grows best on well drained soils but is adaptable to many kinds of soil. Broccoli is very nutrient demanding and should be grown in cool weather. Fertilizers should be indicated for vegetable production. This is usually lower in nitrogen which can inhibit flower production. SNOWBALL Y CAULIFLOWER: This is a French hybrid cauliflower highly prized for its ease of growth and very white heads. These are smaller plants with 6 to 7 inch heads. It has good coverage from its leaves (self-branching) which is important to keep the head from sun burning as it develops. Cauliflower grows best at around 60 degrees. Soil should be kept moist and plants should be feed an organic vegetable fertilizer every couple of weeks. Unfortunately, the demand for brassicas was not sufficient to continue to offer these. We have left this page here for information purposes.